Book: By Zahid H. Bukhari (Editor), Sulayman S. Nyang (Editor), Mumtaz Ahmad (Editor), John L. Esposito (Editor), Taha Jaber Alalwani (Contribution by). Once a year Muslims from around the world—representing a vast range of ethnicities, incomes, ages, and attitudes—perform the Hajj (pilgrimage) and converge in the holy city of Mecca in Saudi Arabia. Now, the global diversity of Muslims at the Hajj is almost repliacted in the United States: new immigrants, Muslims whose families have been here for generations, and converts are coming together, seeing what unites them and what issues they face together. Project MAPS (Muslims in the American Public Square) began in 1999 to provide much-needed information on this understudied and immensely diverse group of six million Americans. 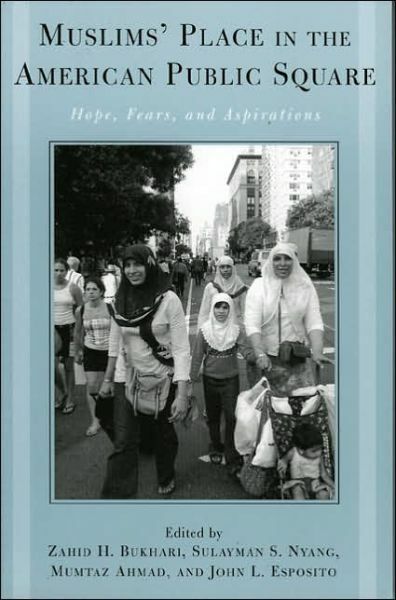 This first volume emerging from the project, Muslims’ Place in the American Public Square, shows where the American Muslim community fits into the American religious and civic landscape both before and after 9/11. Renowned scholars contribute theoretical, legal, historical, and sociological perspectives on how Muslims function in both their own institutions and others. For classes in religion or the social sciences, or for anyone interested in this increasingly significant community, Muslims’ Place in the American Public Square provides a current, balanced introduction. At the dawn of the 21st century, the American Muslim community seemed well along on the path to mainstreaming in American society and institution building. 9/11 has challenged many of these successes and once again raised fundamental questions about Islam, the faith and identity of American Muslims, and their place in American society. Muslims’ Place in the American Public Square provides a much-needed perspective on American Muslims, their experience, and place in American religious history and in the public square. Zahid H. Bukhari is the director of the MAPS Project: Muslims in American Public Square, and fellow of the Center for Muslim-Christian Understanding at Georgetown University. Sulayman S. Nyang teaches at the Department of African Studies, Howard University and is author Islam in the United States. Mumtaz Ahmad is editor of the journal Studies in Contemporary Islam and is professor of political science at Hampton University. John L. Esposito is university professor and director of the Center for Muslim-Christian Understanding: History and International Affairs, at the Edmund Walsh School of Foreign Service at Georgetown University. 3 I: Theoretical Perspectives on the Muslim Experience in the U.S. This post was posted on October 2, 2013, 10:25 am and is filed under Publications. You can follow any responses to this post through RSS 2.0. Both comments and pings are currently closed.